Technically, in most jurisdictions the only shot required for dogs is a rabies vaccine. Still, for the health of your pet, and if you ever want to board or travel with your dog, he requires other vaccinations. Your dog should have certain core vaccines, and you and your vet should discuss whether non-core vaccines are appropriate for your animal. Whether your dog requires a non-core vaccine depends on his lifestyle, region and the regulations of your boarding kennel or doggie day care facility. Puppies should begin receiving vaccinations between the ages of 6 and 8 weeks. The initial puppy inoculations include those for canine parvovirus, canine distemper virus, and canine adenovirus. These vaccines are given together in a combination injection. The series of vaccines finishes at about the age of 4 months. At one year of age, the dog requires another booster for prevention of these diseases, and then receives a booster every three years for the rest of his life. An initial rabies vaccine is given at 4 months, with a booster at 1 year. The following year, the dog can receive a rabies vaccine good for three years, and continue on a three-year vaccination schedule for the rest of his life. Non-core vaccinations include that for Bordetella bronchiseptica, which is usually required by boarding facilities, obedience classes, dog shows and other places where the highly contagious kennel cough can spread. If your dog is often exposed to bodies of water -- ranging from streams to lakes -- your vet may recommend a vaccine against leptospirosis. This bacterial infection, which can prove fatal in some cases, is also spread via contaminated urine and can remain in the soil. If you travel a lot with your pet, or participate in dog shows, the canine influenza virus vaccine is recommended. While a vaccine is available for Lyme disease, many vets don't suggest it for their patients unless the dog's lifestyle puts him at particular risk for this debilitating disease. All states require that dogs remain current on their rabies vaccinations. Some states allow exemptions under very specific conditions. Florida, for example, allows an exemption if a licensed veterinarian determines that a rabies vaccination would endanger a dog's health because of age or medical infirmity. 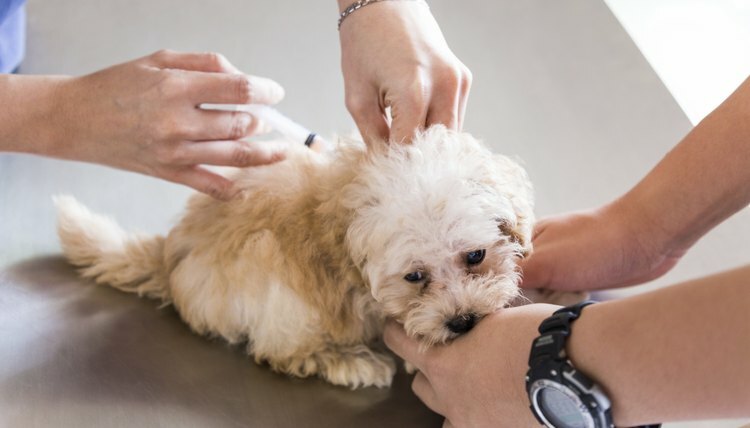 Regulations in other states have similar wording and exemptions, often with the stipulation that the vet must annually examine and determine the animal shouldn't be vaccinated for health reasons. In Virginia, a local board of health may grant an exemption. If you're concerned about over-vaccinating your dog, ask your vet to conduct a vaccine titer via a blood test. This test determines whether your pet has sufficient antibodies in his system, resulting from previous vaccinations. If the test indicates that your dog has high vaccine titer levels, he doesn't need a current booster inoculation. If his titers are low, he will need a booster vaccination. One caveat: The cost of vaccine titer testing is more expensive than vaccinating.